This event will take place on Friday, June 9th from 8:45 – 13:00 in DCU Business School (Glasnevin campus). This is the first year of these events. The first symposium was held in February and focused on the opportunities and challenges presented by the Capital Markets Union and fintech. During this full day event, we explored the future of banking, high frequency trading, cybersecurity and legal considerations for fintech, as well as the opportunities and challenges for cloud adoption in the financial services sector. The 2nd symposium is a half day event and will focus on ‘alternative’ sources of finance. One of the major issues SMEs and start-ups have to deal with is fundraising. However, recent technology developments in the financial services have enabled the creation of valuable alternatives to this problem such as crowdfunding and peer-to-peer lending. In this meeting, our speakers and panelists will discuss the opportunities and challenges associated with peer-to-peer lending and crowdfunding from a business, legal and regulatory perspectives. DCU Business School has recently joined the European Capital Markets Cooperative Research Centre, a foundation to promote and facilitate capital markets research amongst research institutions and industry, and has launched the Finance Innovation Group in order to support the Irish financial services industry. 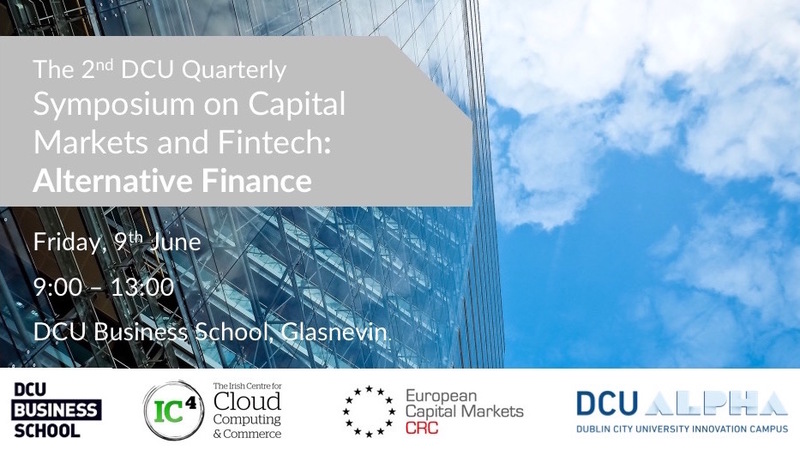 The Finance Innovation Group is a new research group comprising researchers from the Irish Centre for Cloud Computing and Commerce (IC4) and members of DCU Business School with an interest in finance and financial technologies. This new research group brings together researchers with a wide range of interests including sustainable finance, capital markets, risk management, applied econometrics, corporate governance, cyber security and financial technology. The financial services industry is going through a period of significant transformation that is creating valuable opportunities and significant challenges therefore we believe it is important to explore the potential impacts of this technology innovation on businesses. What exciting things can people look forward to at this second symposium? And Niall Dorrian, CEO of Linked Finance. With a unique blend of both academic and industry speakers, attendees will be provided with a complete picture of the current alternative finance landscape in Ireland. Industry and academic speakers will provide insights into the current alternative finance landscape in Ireland and will alternate with networking breaks to support interaction and discussions among attendees. The first symposium brought together over 80 stakeholders operating in the financial services and technology sectors including industry, regulators, and academics and we hope to do the same for this event. This is a free event however, places are limited so early registration is advised. DCU’s Glasnevin campus is located on the north side of the city, just 6km from the city centre. The campus is bordered by the Ballymun Road and Collins Avenue and is a short distance from Dublin Airport and the M50 and M1 motorways. There is also a large multi-story car park for those travelling by car to the event.